Out of all the dental procedures, most people fear a root canal over any other. In fact, many people fear a root canal over public speaking or flying. Even though it’s a common fear, many people can’t explain what a root canal actually is. 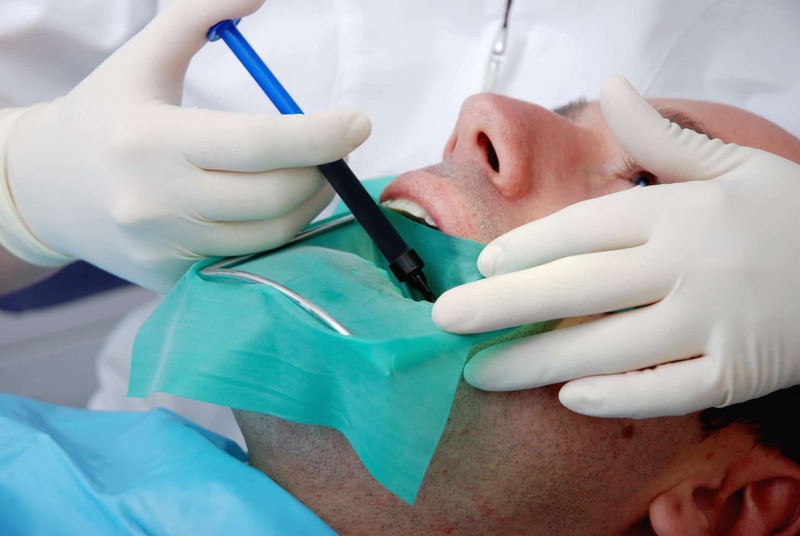 A root canal is a procedure that’s often required when a tooth is severely infected. While the procedure itself can be painful, an infected tooth can be even worse. If a dentist recommends a root canal, it’s most likely necessary so the infection doesn’t spread or cause more pain. Today, a root canal could have an entirely different meaning thanks to the developments of a new peptide hydrogel. Below we explore how a tooth becomes infected, the root canal procedure, and how a root canal will change in the future. A tooth can become infected for a number of reasons. An injury to the tooth, a chip, or a cavity that’s been left unchecked can cause an infection. The inside of the tooth is composed of tissues, veins, and arteries called the pulp or the pulp chamber of the tooth. The nerve of the tooth is often referred to as the legs or the root. The root canal procedure goes from the nerve of the tooth all the way up into the pulp chamber. Most people will know immediately if a tooth is infected because there are dramatic symptoms that are hard to ignore. Normally, you’ll suffer from severe pain when chewing or placing pressure on the tooth. You’ll feel pain or sensitivity with hot or cold temperatures. The gums will be very tender. You might even notice a slight discoloration in the tooth. Once bacteria gets into the pulp chamber, it starts to destroy it. This infection in the pulp chamber can cause a lot of damage if nothing is done to fix it. It can spread to other areas of the mouth and swelling can occur around the face and neck. Infections can also cause bone loss around the root of the tooth. Once an infection is detected, a root canal is normally the only option. Sometimes a root canal requires multiple visits to the dentist. You’ll need your dentist to fully examine the location and extent of the infection. After X-rays and a consultation, you’ll be ready for the root canal procedure. Because the nerve is dead in some cases, anesthesia isn’t always required. Most dentists will offer this anyways to assure a more comforting experience for the patient. A small hole is drilled to gain access to the interior of the tooth. The dentist will then begin to clean out the tooth using small files. Once the pulp is completely cleaned out, the tooth is cleaned with an antibacterial serum to avoid further infections. The tooth is then filled and sealed. It appears to be a logical procedure for an infection. The bacteria and decaying parts are removed and the tooth is repaired from the inside out. However, herein lies the problem with a root canal. After a root canal, the tooth is dead. The nerve endings and pulp chamber have been removed. The dental pulp is what keeps the tooth alive. Once it’s removed, there’s nothing left to sustain the tooth. The tooth then becomes very vulnerable to further infection or risks being removed. This is why dentists and endodontists are so excited about this new scientific development. Instead of the tooth dying from a root canal, it could actually begin to heal and recover. The new material is called peptide hydrogel and it was presented in August 2018 at the 256th National Meeting & Exposition of the American Chemical Society (ACS). This team of innovators is led by Drs. Vivek Kumar and Peter Nguyen of the New Jersey Institute of Technology. Basically, the peptide hydrogel prompts angiogenesis, which is the growth of new blood vessels. It can also cause dentinogenesis, which is the rapid reproduction of dental pulp stem cells. The peptide hydrogel is meant to replace the use gutta-percha, the rubber-like substance injected into the tooth during the filing stage. The potential of these new materials is huge for the dental community. This hydrogel is very exciting, especially for those who may be prone to infection. If you think you may have symptoms of an infection, it’s best to contact your dentist right away. Never wait for multiple painful symptoms to arise. Remember that infections left unchecked could lead to more severe problems. These issues can be very painful and end up being more costly to fix. If you think you may need a root canal, contact your dentist to schedule an appointment. Ask your dentist about the potential of peptide hydrogel and if it’s right for you.